As the age of legends comes to a close, veterans of the Monster Hunt Bureau are facing some pretty severe structural unemployment. They have just been too good at their job, but when a civil war in the monster realms spills over into the human world, their skills will be needed again. 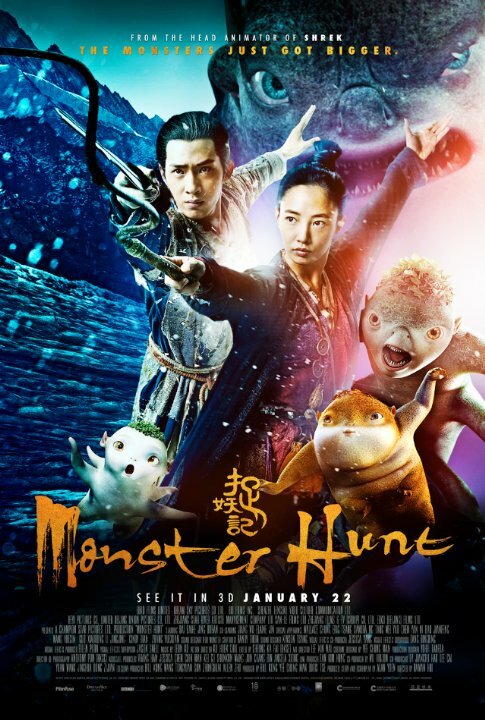 However, choosing sides will be trickier than they imagine in Raman Hui’s CGI-live action Chinese blockbuster, Monster Hunt (trailer here), which opens this Friday in New York with both subtitled and dubbed screenings. Song Tianyin is not much, but his absentee palace swordsman father still set him up as the mayor of their provincial village. He is about to be swept up into the monster’s civil strife when junior monster hunter Huo Xiaolan tracks two monsters in disguise to Song’s inn. Zhugao and Fat Ying are desperately protecting the pregnant queen, whose unborn baby is some sort of prophesized Jedi-Matrix Chosen One. The evil monster rebels have followed her into the human lands to end their royal line—and they are really big. Although Huo initially captures Zhugao and Fat Ying, they manage to wriggle away, but she knows they will not get far. Since the Monster Queen was able to transfer her unborn baby to Song, Huo knows they will always be close by. Huo convinces Song to carry the baby, despite his understandable gender-role confusion, so they can sell him to a dealer. Evidently, monster babies are quite a delicacy. Yet, when the little “radish” springs into the world, they inevitably cannot stop themselves from getting emotionally attached. So why can’t humans and monsters live together Alan Yuen asks us with his heavy-handed script. Maybe because those big marauding beasts really seem pretty darned dangerous. Nevertheless, the little radish is rather cute. Hui, who co-directed Shrek the Third, gives the monsters a good deal of personality, specifically tailoring them for the Chinese-centric market. It is easy to see why little boys would flock to Monster Hunt, even though it is somewhat more bittersweet than most mainstream American animated films. Of course, some of that is necessitated by the set-up for the sequel already in production. Bai Baihe’s freshly minted superstar status is largely due to her breakout work in Hunt. She is indeed slyly engaging as Huo, especially in her scenes with older rival Luo Gang, nicely played Jiang Wu, who manages to maintain his hardboiled gravitas amid all the chaos and cuteness. On the other hand, Jing Boran is an awkward combination of klutzy shtick and faceless blandness, but to be fair, he probably did not expect to be stepping into Song’s shoes. Well after production began, he replaced Kai Ko, when the Tiny Times actor was swept up in the Jaycee Chan business. Monster Hunt also features Tang Wei and Yao Chen in goofy, slightly macabre Tim Burton-esque cameos that bizarrely play down their glamour. Sandra Ng and Eric Tsang add further star power, fitting comfortably into the roles of bickering monsters Zhugao and Fat Ying, when they are wearing their human skins. The monsters are quite impressive, which would be the most important part of a film called Monster Hunt. Nevertheless, the narrative is disappointingly familiar and much of the broad humor will fall flat with American audiences. Still, the film is a genuine phenomenon (controversies of box-office inflation notwithstanding). Hui does what he does best quite well, but he should apply more of his Hollywood experience during the script-development period. Interesting but not essential for animation fans, Monster Hunt opens in both formats this Friday (1/22) in New York, at the AMC Empire.